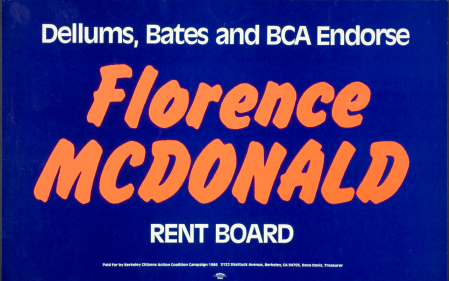 Florence McDonald was elected Auditor in 1975, City Councilmember in 1979, and Rent Board Commissioner in 1986, the race featured in this poster. No one else won so many different Berkeley offices without a defeat. As Auditor, Florence tried to reduce her salary to the same as the highest paid ordinary worker. The bureaucracy fought her, but the voters grew to love Florence. Florence had a real family, including husband Worden and their son, singer Country Joe McDonald, who would perform his "Fixin' To Die Rag" anti-Vietnam War anthem at our rallies. But BCA was a second family to Florence and she was BCA's honorary grandmother. Florence also cleaned up after meetings, fundraisers, or political dinners. Florence actually had a radical, activist, working class background dating back to before the Depression era. Her father was an anarchist tailor, her mother a former Russian Communist revolutionary. Not surprisingly, Florence was passionate about BCA fulfilling its political potential. She challenged the organization to bounce back from its many defeats the way she had personally survived a lifetime of political setbacks. Florence's approach combined ideology and pragmatism. When she wanted something, it was impossible to stand in her way. From her hospital bed, Florence demanded of Gus Newport that he run for Mayor in 1979. He gave in, and together they changed Berkeley's history. When control of the Rent Board hung in the balance between tenants and landlords, Florence ran for her last office in 1986 and won again. She was re-elected in 1988, only to pass away the next year. Her departure from the political scene may have been the worst loss BCA ever suffered. As for the elected Rent Board, landlords did eventually gain power, to the great detriment of rent control. BCA and other pro-tenant forces took the Rent Board back. The landlords shifted their strategy to passage of anti-rent control bills such as vacancy de-control by the State Legislature. Once rent control had been weakened to their satisfaction, Berkeley landlords let pro-tenant slates run unopposed. Thus, Berkeley's current Rent Control Board always knows which side it is on. So did Florence McDonald.